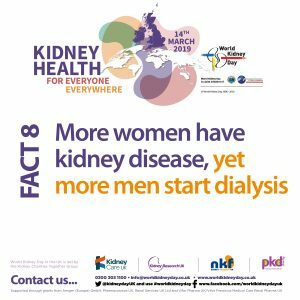 Kidneys are essential to our health. 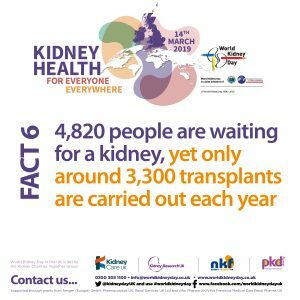 Kidneys are normally very efficient but when they are damaged or lose function over time, this is known as chronic kidney disease (CKD). 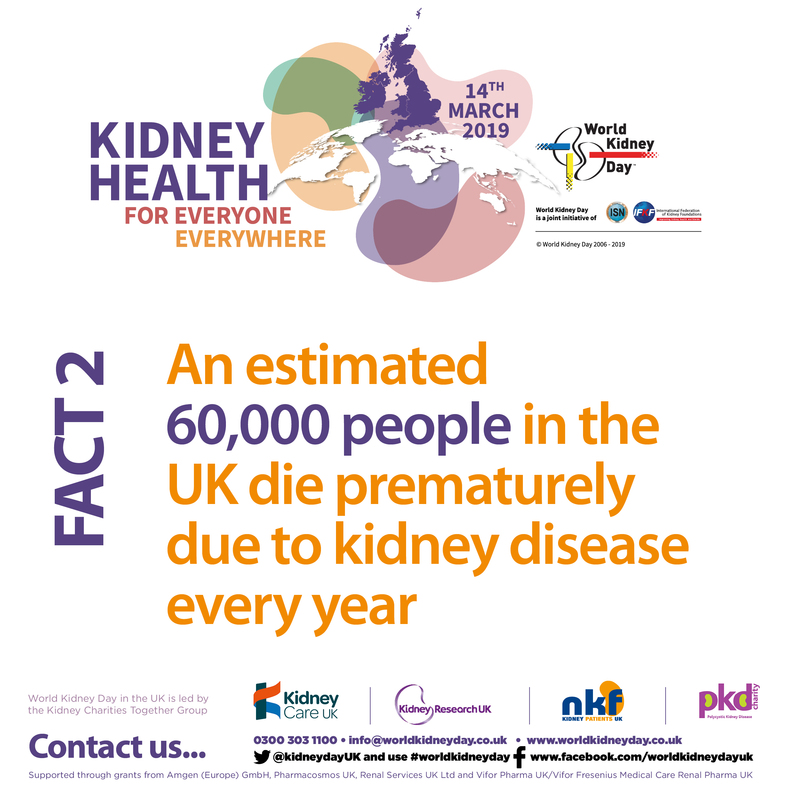 CKD affects over 3 million people in the UK but up to a million of these people may be undiagnosed. 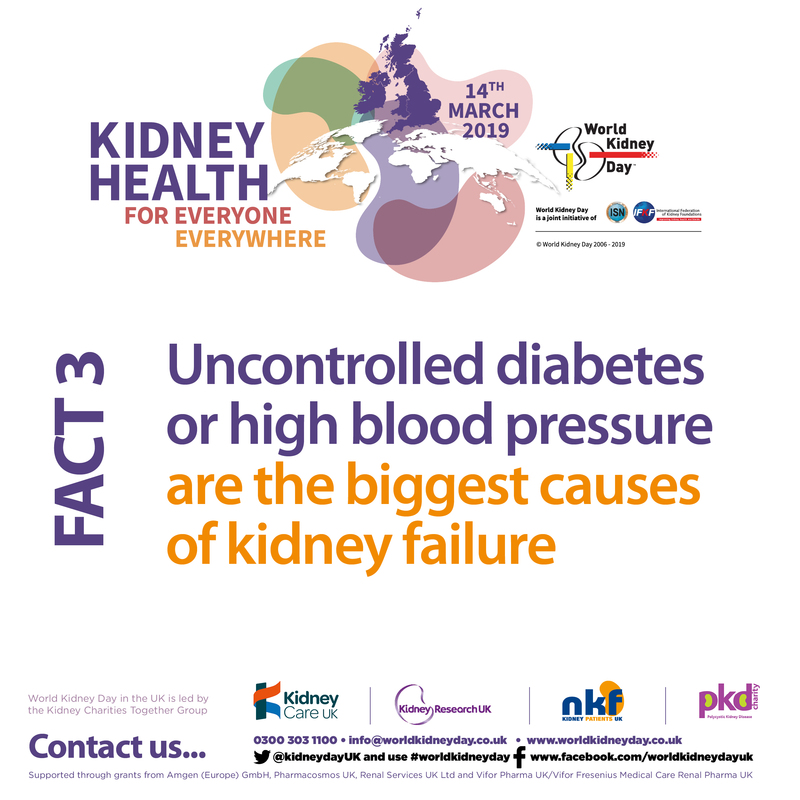 The biggest risk to CKD is from uncontrolled diabetes or high blood pressure. 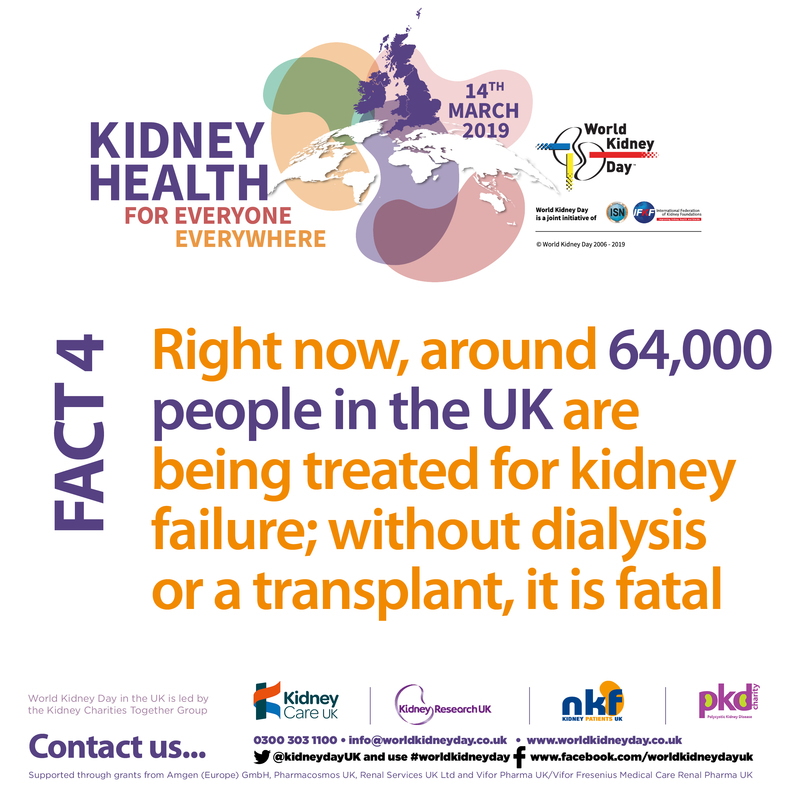 Other causes include problems with the immune system, infections or having an inherited kidney condition. 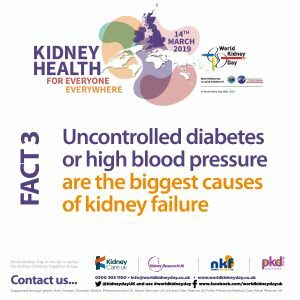 Early diagnosis and prompt treatment, as well as changes in diet and lifestyle, are vital and can often help slow down or prevent any further damage. 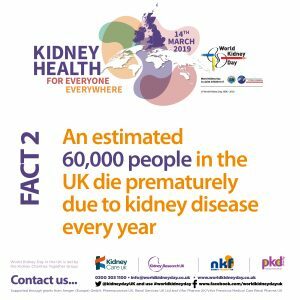 Left unchecked, however, CKD can progress to kidney failure, which is fatal without treatment by dialysis or a kidney transplant. 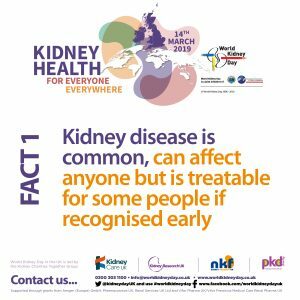 Children as well as adults can be affected by kidney disease but this is usually owing to birth defects and inherited genetic kidney conditions. 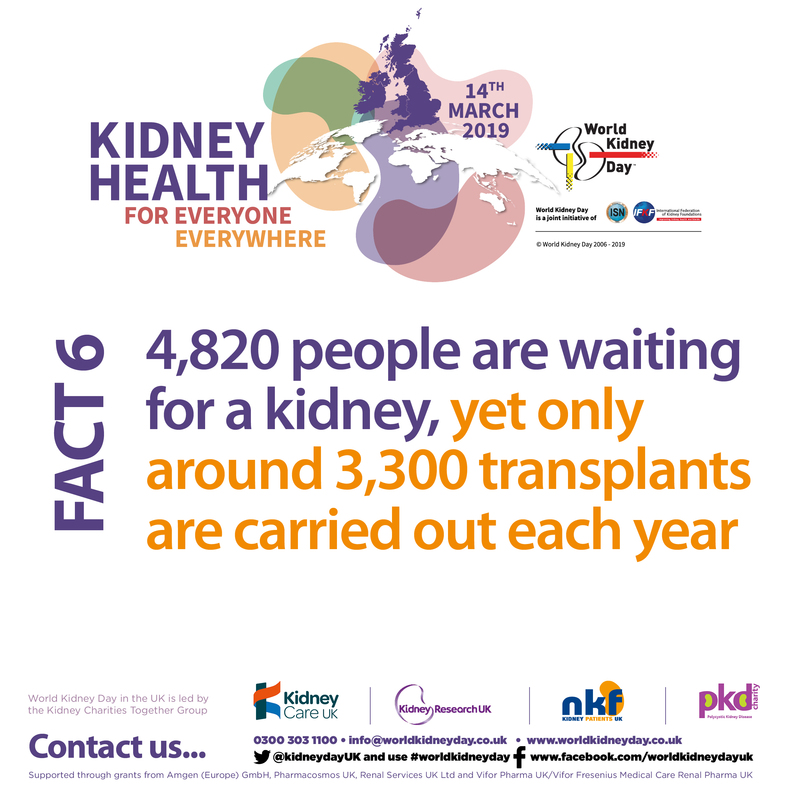 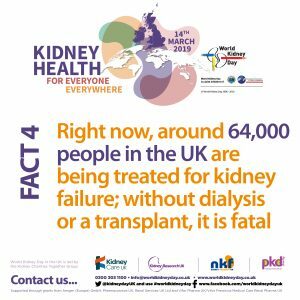 So here is the full set of our daily kidney facts which we have been releasing through social media since 7th March, as well as a montage of all 8. 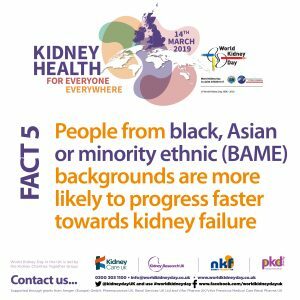 BAME patients make up a third of the waiting list and have a longer wait for a kidney transplant; many will die waiting. Acute kidney injury (AKI) is a sudden drop in kidney function due to serious illness. 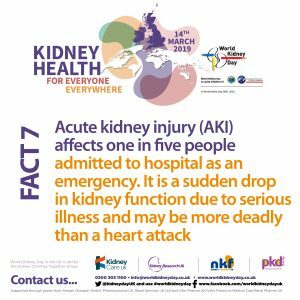 It affects 1 in 5 people admitted to hospital as an emergency and may be more deadly than a heart attack. 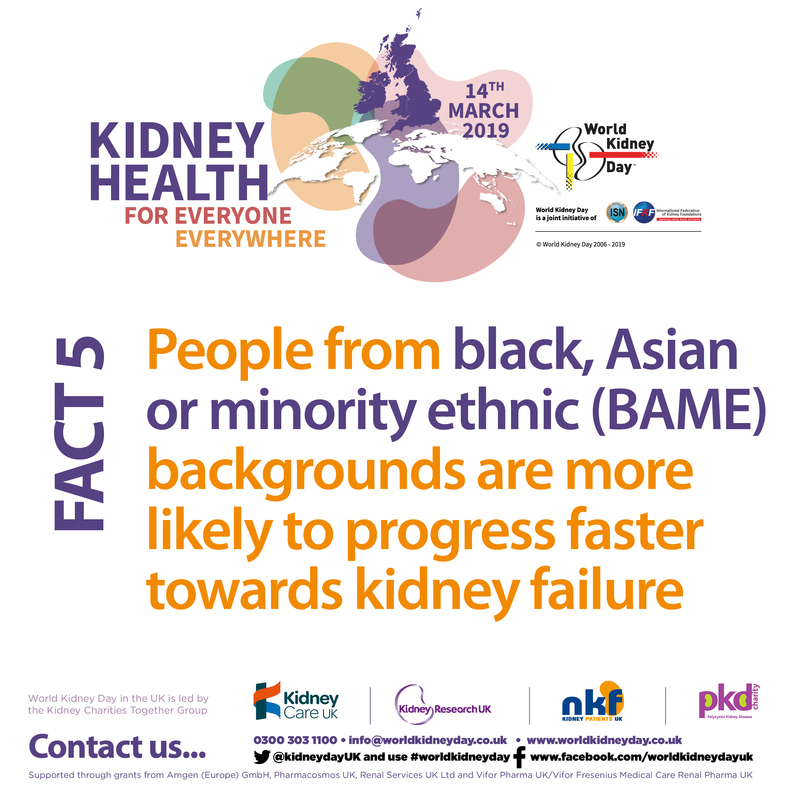 A black, Asian or minority ethnic background could mean an increased risk of developing kidney failure more quickly. 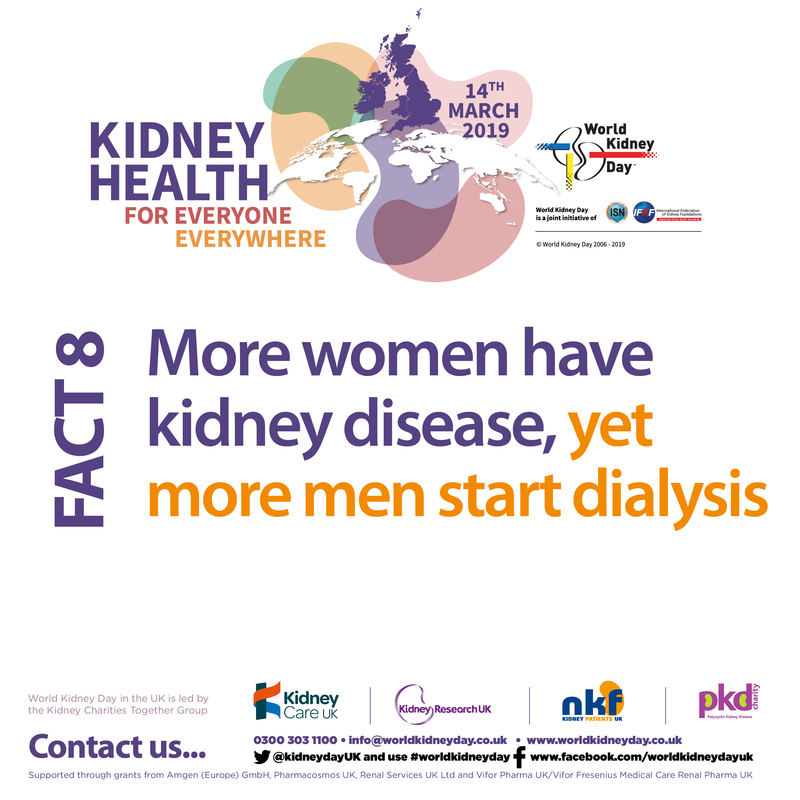 There are several easy ways to reduce the risk of developing kidney disease. 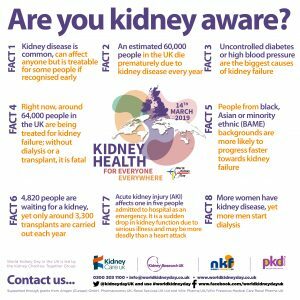 Some small changes in behaviour and lifestyle (including taking more exercise) can have enormous health benefits. 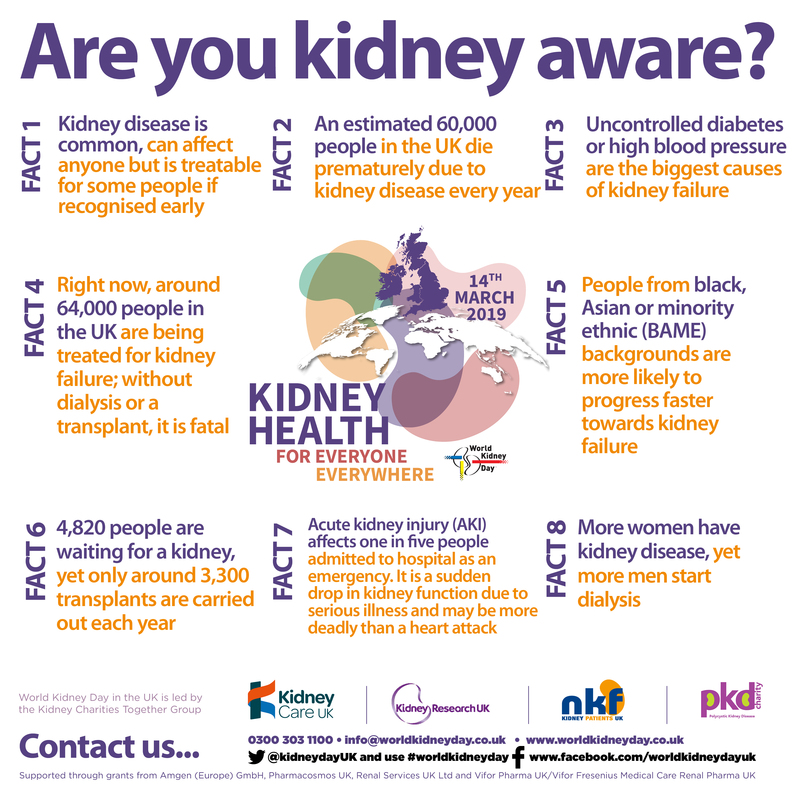 Get advice – If you know that you have kidney disease and become unwell e.g. 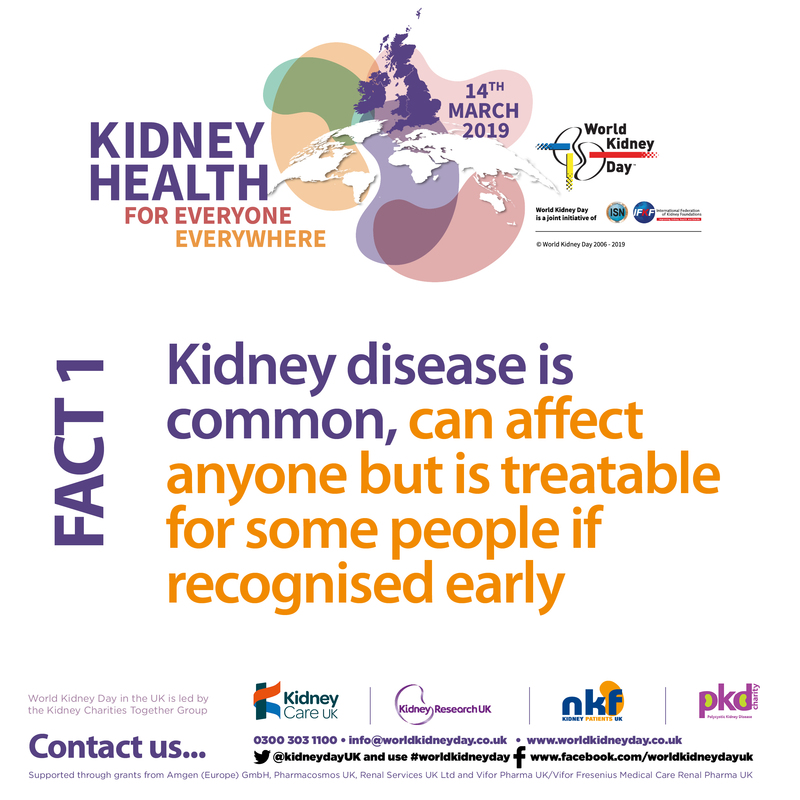 with diarrhoea and vomiting, get advice from your doctor about the medications you are taking.